東海地区本部主催 「松林流空手道セミナーin浜松」 日時：平成31年4月20日（土）13～16時　浜松市武道館／4月21日（日）　13～16時　南部協働センター 講師：當銘岩雄　範士9段　眞喜志哲雄　錬士6段　／　招聘団体：世界松林流空手道連盟　東海地区本部 道場主：小波藏政昭　教士8段・安達猛　錬士6段・壬生進紀　錬士6段・塚本勝博　錬士6段 セミナー内容：松林流１８の形の動作の確認・解釈． 初日会場：浜松市武道館　www.city.hamamatsu.shizuoka.jp/maps/c-budou.html 2日目会場：南部協働センター　https://www.mb.eprs.jp/contents/facilities/2060/indeex.html 問い合わせ先：小波藏政昭　（Ｅメールmkohagura@leaf.ocn.ne.jp）携帯電話　090-6094-7876) Hamamatsu Japan Seminar with sensei Iwao Tome Hanshi 9th Dan in April 2019 Japan Tokai District seminar with Iwao Tome Hanshi 9th dan & Tetsuo Makishi Renshi 6 th dan will be held on 20 and 21 April 2019 at Hamamatsu city in Shizuoka prefecture. 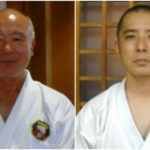 The seminar is hosted by Masaaki Kohagura Kyoshi 8the dan and other 3 Renshi 6th dan dojo owners in Tokai District. If you are interesting in the seminar and Hamamatsu city, please email to Mr. Masaaki Kohagura and visit Hamamatsu city website shown in Japanese version. 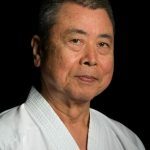 USA Dojo Seminar with Toshimitsu Arakaki, 10th dan, Hanshi on 20 and 21 September 2019 for members of the World Matsubayashi-Ryu Karate-do Association. 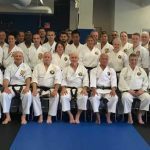 Seminar hosted by Fred Christian, 8th dan Kyoshi and Westminster Matsubayashi Karate Club’s Marsha Lauko and Ed French. Located in Belleville, Illinois about 10 miles east of St Louis Mo., just off interstate 64. For information, registration form or questions email matsu-seminar@pobox.com or call Mr. Fred Christian at 618-397-8747 or Mr. Ed French 618-830-8192. Dear WMKA members from around the world, A Happy New Year! Shin-nen akemashite omedetou gozaimasu! I congratulate you all in welcoming a bright new year wherever you are living now. We are celebrating a wonderful new year with our families, friends and communities here in Okinawa. 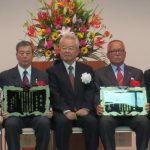 On November 8th, 2017 Yoshitaka Taira Hanshi, President of the WMKA, was awarded the prestigious Cultural Commendation from the Prefecture of Okinawa. This commendation was awarded for his cultural contribution in the field of karate and kobujutsu. 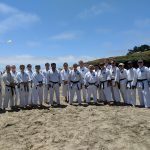 The next USA Matsubayashi Seminar will be held in San Jose, California from July 20, 2018 through July 22, 2018. 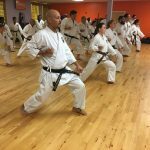 The seminar will include kihon drills, specific kata review and corrections, kata applications, Sotai Renshu drills and instruction in bo Kata. 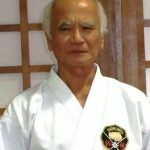 Arakaki Sensei will be sharing his insights on kata and various new aspects of traditional karate. Practicing Matsubayashi Ryu martial artists from across the continent came together this weekend in Cocoa Beach to honor Soke Takayoshi Nagamine. Soke previously came to visit Cocoa Beach in July of 2011. He was to do so again in 2012, but passed away in April of that year. 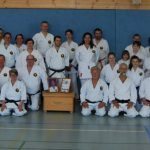 News Post August 10, 2917: On July 31st to August 6th Toshimitsu Arakaki, Hanshi, 10th,visited Canada. 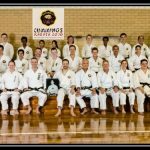 Hosted by Steve Trombly, Kyoshi, 7th Dan, training sessions were conducted twice daily. Arakaki Sensei corrected kata and instructed various new aspects of traditional karate.